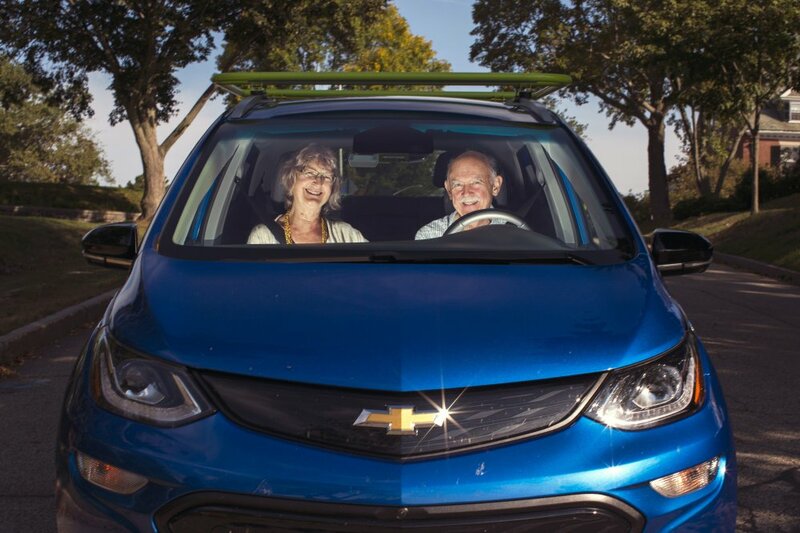 These retirees are are loving their new electric Chevy Bolt. First of all, the Chevy Bolt is not technically Allen Armstrong’s car. It’s his wife Elissa’s, but she lets him drive it, all over their hometown of Portland and beyond. She also gave the go-ahead to talk to Source about just what makes it so great, how much it cost them and how a guy who used to treasure his gas guzzlers got interested in electric cars in the first place. IS THIS YOUR FIRST? First fully electric car, yes, but Allen Armstrong has a hybrid already, an early generation (2006) Honda Insight. The Armstrongs do have two other electric vehicles however. WHAT: Fall Electric Drive Days: Learn how hundreds of Mainers are saving money, embracing clean transportation, and reducing pollution. You can talk to Mainers who already own electric cars and get test drives from dealers. PLUG IT IN: Wait, a wall outlet? Yes, Armstrong explains, he can charge the car on a 110-volt outlet, it just doesn’t take the charge very fast (4 miles per hour). At home he’s got a 220-volt outlet for the car. “That will charge at 25 mph.” Thus his bedtime routine involves plugging in the car. “It works best if you let it go overnight, so having one in one’s home is pretty convenient.” They have yet to try out a commercial charger, even though they’ve had the Bolt since the beginning of June. PRICE TAG: What did the blue Bolt cost them? “After the tax credit, it will cost us about $35,000.” The tax credit is $7,500, and if they don’t have that kind of tax liability this year, they can roll it over, as they once did with their solar panels. They installed the panels about five years ago, and because the historic district in the West End limited what they could do to the roof, the panels produce just 1.8 kilowatts of power. Recently they joined the Freeport community solar farm to pick up another 6 kilowatts. AN AWAKENING: He says it was a shock to realize he should alter a lifelong habit that started in 1957 when he acquired a 1947 Renault (“totally worn out. Had taken four coal miners to work for years in Illinois before I got it”). “I had loved old gas-powered things. I had a lot of motorcycles. Chainsaws. Every kind of gas-powered thing and particularly old cars. All of a sudden I realized I can’t have fun blasting around in these things knowing that I am polluting the atmosphere.” Or more like, contributing to climate change, right? Yes, Armstrong says.